Bio-Synthesis offers accredited DNA Genotyping Services, following GLP guidelines for human cell line authentication and mycoplasma detection. These services are performed at accredited human DNA identity testing facilities by our team of scientists with years of experience in SNP, STR DNA profiling, high-resolution Luminex HLA DNA genotyping, DNA sequencing and bioinformatics data analysis. We provide our customers with the highest discriminating methods for species and identity confirmation, detection of cell cross-contamination and cell misidentification, assuring compliance with NIH recommendations and scholarly journal guidelines. At our DNA Identity Testing Center, we make it easy and affordable to authenticate human cell lines and primary cells. Contact our customer service center or send an email to info@biosyn.com to find the right service package for your project. Unknown Sample Profiling: Short tandem repeat (STR) profiling of a cell line sample using AmpFℓSTR® Identifiler® for high resolution screening and intra-species cross-contamination detection. 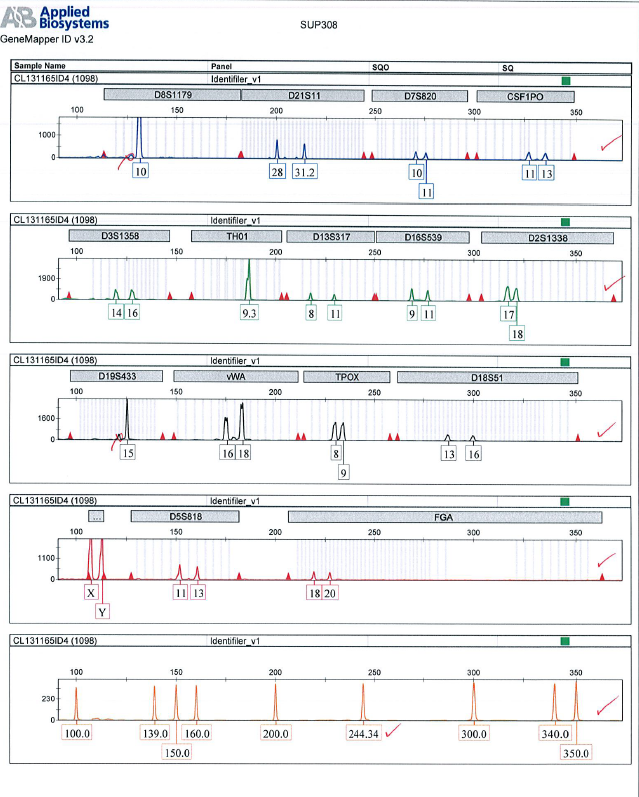 Known Reference Profiling: Short tandem repeat (STR) profiling of a cell line sample using AmpFℓSTR® Identifiler® for high resolution screening and intra-species cross-contamination detection or a database lookup of a known cell line profile at one of the recognized repositories (ATCC). Comparison Analysis: Comparison study of the known and unknown samples to determine whether the profiles match or if any contamination or mutations have occurred relative to the known sample. 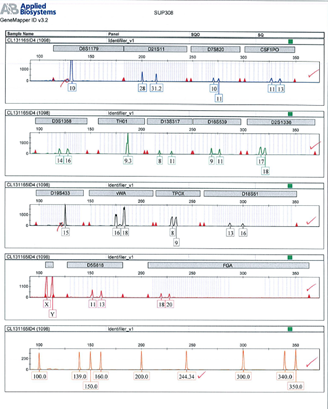 Known Reference Profiling: Short tandem repeat (STR) profiling of a cell line sample using AmpFℓSTR® Identifiler® for high resolution screening and intra-species cross-contamination detection or a database lookup of a known cell line profile at one of the recognized repositories (ATCC, DSMZ, and JCRB). Bioinformatics Data Analysis: Database search and analysis to identify cell origin of unknown sample with the closest matches, and any drift in genotype using three recognized repositories (ATCC, DSMZ, and JCRB). The sample contributor will be advised of any resulting matches in the certificate of analysis. Electropherogram: An original electropherogram will be provided to give you the exact intensities of each allele detected. Notarization: Notarization of certificate of analysis will be provided. High-Resolution Luminex HLA DNA Genotyping (Extended Cell Line Identification): This high-resolution HLA analysis is used for populations that interbreed closely. We offer volume discounts for DNA extraction, please inquire. Profile Search: Using only the name or ATCC number of your cell line, we can accurately find its DNA profile in recognized repositories (ATCC, DSMZ, and JCRB). Bioinformatics Data Analysis: Database search and analysis to identify cell origin of unknown sample with the closest matches, and any drift in genotype using three recognized repositories (ATCC, DSMZ, and JCRB). The sample contributor will be advised of any resulting matches in the certificate of analysis. 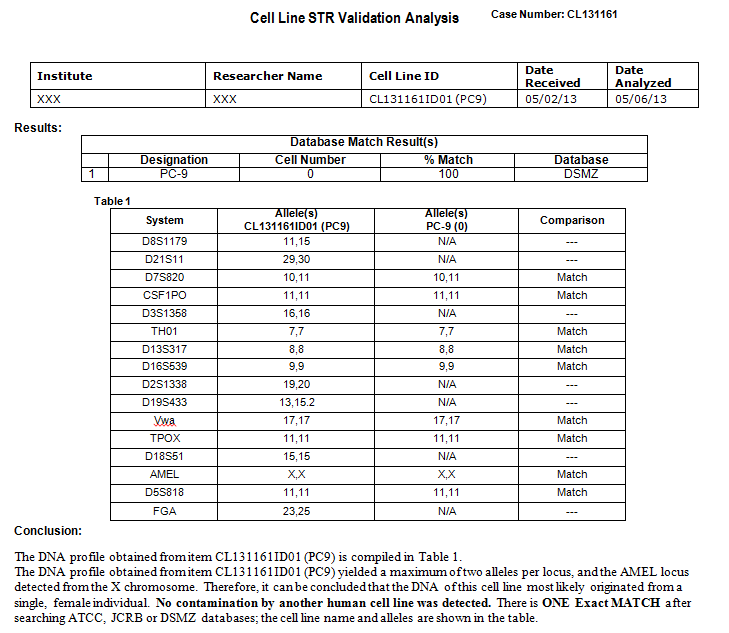 Cell line profile must be provided. Species-Specifics Authentication: Our species-specifics authentication services can selectively verify whether the cell line in question is indeed one of the 14 detectable species using our two-pronged inter-species identification and detection approach. Intra-species identification services are currently only available for human cell lines. Electropherogram: The original electropherogram will be provided to give you the exact intensities of each allele detected. 1. Drexler, H.G., Dirks, W.G. and MacLeod, R.A.F. (1999) Leukemia 13, 1601–7. 2. Drexler, H. G. et al. (2001) Blood 98, 3495–6. 3. Cabrera, C.M. et al. (2006) Cytotechnology 51, 45–50. 4. Chatterjee, R. (2007) Science 315, 928–31. 5. MacLeod, R.A.F. et al. (1999) Int. J. Cancer 83, 555–63. The availability of well-characterized, viable human tissues and cell lines accompanied by pertinent donor data is a prerequisite for a great deal of current biomedical and transplantation research. Unfortunately, the misidentification and cross-contamination of human tissue cell lines occurs frequently. It is estimated that over 20% of all established cell lines are misclassified by cell type or species of origin, and over 33% of all cell lines suffer inter- or intra-species cross-contamination (1-3). The ATCC, along with the Coriell Institute for Medical Research, the European Collection of Cell Cultures (ECACC), the Deutsche Sammlung von Mikrorganismen and Zellkulturen (DSMZ), and the Japanese Collection of Research Resources have all received cell line submissions that, upon authentication, were determined to have been misidentified by the depositor (4,5). This poses a serious threat to the legitimacy of research findings produced from any of these cell cultures. To aid clients in need of cell line identity validation, Bio-Synthesis (BSI) offers fast and reliable human cell line identification services to authenticate your cell lines. Scientists, with experience in STR DNA profiling, SNP genotyping, high-resolution Luminex HLA DNA typing, tissue microarray analysis and bioinformaticsdata analysis, perform DNA Identification at our accredited DNA testing facilities. Our commitment to total quality management assures our client's that our scientists employ efficient methods to confirming species' identity and detect cross-contamination, authenticating our client's cell lines in full compliance with NIH recommendations and scholarly journal guidelines. Bio-Synthesis offers several different levels of cell authentication services at NO Additional Fees ! In addition, Bio-Synthesis offers microarray detection and analysis. This integrated service solution can be fully leveraged to generate top-quality results at the fastest possible turnaround time for your cancer cell and stem cell research needs. Cell line contamination must be avoided to assure absolute reliability of the cell line authentication process. Cells used in basic and applied research can become altered in culture, either by contamination from other cell lines or by spontaneous genetic changes. The American Type Culture Collection (ATCC) recommends that researchers use low-passage cell lines and genotyping to authenticate cell line to assure reliable and reproducible results. Why Choose Bio-Synthesis to authenticate your cell line? Our standard cell line genotyping PCR test detects contamination and mutations between human cells as well as verifies whether the cell line in question originates from a human by detecting the absence of standard markers. Our species-specific authentication services can selectively verify whether the cell line in question is indeed one of the 14 detectable species using our two-pronged inter-species identification and detection approach. Intra-species identification services is currently only available for human cell lines. 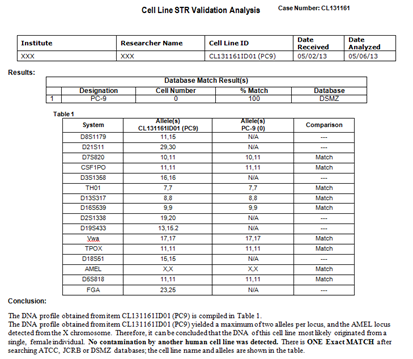 Cell line authentication can verify whether the genotype of the cell line in question is identical to the genotype of the presumed parental cells. If the parental cells genotypes have been determined by a recognized repository (ATCC, DSMZ, or JCRB), the genotype of the submitted cells can be compared to genotypes in the database. Bio-Synthesis can also genotype any parental cells not already represented in the database. When should cell line Identification and authentication be conducted? The National Institute of Health and a multitude of scholarly journals have defined guidelines for the authentication of any cell line to be used in grant-eligible projects or in papers submitted for publication. Authentication is required every time a new line is established or acquired. Cells should be re-authenticated at the following stage: before freezing, Bimonthly while the culture is actively growing, at any point where the performance of the cell line yields inconsistent or unexpected results, and before publication. Cells must be tested if more than one cell line is under investigation in order to rule out cross-contamination. Cells must be tested when starting new experiments. Cell line authentication and identification services from Bio-Synthesis are conducted under strict quality control processes. Our GLP quality human cell line genotyping and characterization services offers rapid and accurate cell line identification by analyzing a pattern of defined short tandem repeats (STR). Cell line contamination is detected by the presence of 3 or more alleles using GeneMapper ID®Software. Bio-Synthesis is committed to Total Quality Management (TQM) to assure our customers' complete satisfaction. QA (quality assurance) procedures are repeated for independent verification and are compliant with AABB and FDA regulations. There is a minimum requirement of 100k cells if DNA has not been extracted. Please spin down the cells in an Eppendorf tube, wash the cell pellet with PBS buffer once and vac-dry without heating. Make sure the pellets are completely dry before shipping. There is a minimum requirement of 100k cells if DNA has not been extracted. Please spin down the cells in an Eppendorf tube, wash the cell pellet with PBS buffer once and immediately freeze it with liquid nitrogen. Keep frozen and ship in dry ice. If your cell line tubes are preserved in liquid nitrogen, you may send one tube to us as-is in dry ice. Please provide at least 100 ng of DNA in 10 μL TE buffer or water. Include a 1% agarose gel picture to show DNA integrity. Please make sure that the samples do not contain anything hazardous. When placing order online, please include cell line validation sample submission form with the sample. To place an order please use the Online Cell Line Order Form. If you have any questions or would like to inquire about the status of your order, please contact us.